The following samples were performed by Richard Stoelzel & Slawomir Cichor with the Polish Camerata. This version for strings, harp and percussion comes as a 9"x12" spine stapled score. Parts are supplied on a CD-rom disc. Two 9"x12" trumpet solo parts are also included. 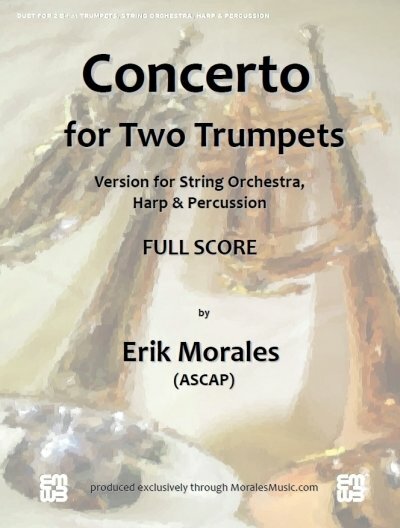 The original “Concerto for Two Trumpets” was composed in 2012-2013 and was originally scored for wind symphony instrumentation. That version was soon followed by a piano reduced version and, two years later, this current version for string orchestra, harp and percussion. No changes were made to the form of the original work. However, because of the drastic change of instrumentation, this new version presents differently in terms of tone colors and ensemble sound. This three movement work can be best described as a celebration of all that is great about the trumpet. In keeping with my philosophy of the importance of melody each movement is carefully crafted to entertain and engage the listener. The piece was designed specifically for the B-flat Trumpet. A few requests were made for transposed C Trumpet parts but the piece plays far easier on the B-flat instrument. Careful consideration is given to how the musical passages are fingered. Plus, the slightly darker quality of the B-flat trumpet is desired. My goal was to have the two soloists as “equals”. So there are several passages where both soloists are playing in unison. This fortifies the melodic passages with a deep, full sounding chorus effect. Each soloist has an opportunity to shine. You should not attempt to play the first movement faster than the tempo marked (quarter note=126 beats per minute) as sixteenth notes become increasingly difficult to play using a clean single-tongue technique. All three movements are designed to run together with no “break time” in between. The total duration is approximately 17 minutes (depending, of course, on chosen tempos).